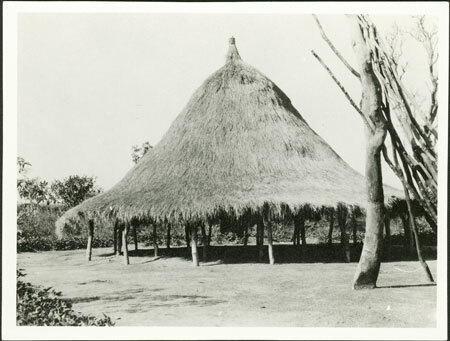 A large thatched hut with long eaves supported on stakes but no walls, probably a meeting hut of the type known as baruti or possibly yepu (which is sometimes also used to describe an open shelter such as a cooking hut). Morton, Chris. "Zande meeting hut" Southern Sudan Project (in development). 03 Jan. 2006. Pitt Rivers Museum. <http://southernsudan.prm.ox.ac.uk/details/1998.341.339.2/>.